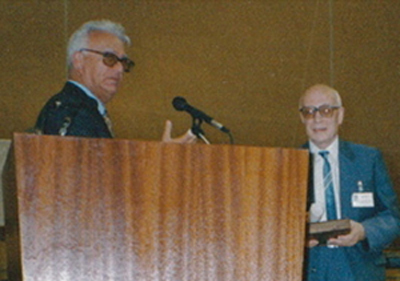 Presentation by President Mario Nardelli of the Ewald Prize to Boris Vainshtein at the Opening Ceremony of the 1990 Bordeaux Congress. In 1990 it was announced that the second Ewald Prize had been awarded to Professor B.K. Vainshtein (Institute of Crystallography, Academy of Sciences, Moscow, Russia) for his contributions to the development of theories and methods of structure analysis by electron and X-ray diffraction and for his applications of his theories to structural investigations of polymers, liquid crystals, peptides and proteins. The presentation of the Ewald Prize was made during the Bordeaux Congress Opening Ceremony in August 1990. For a list of papers by Professor Vainshtein appearing in IUCr journals click here.